Thinking about installing a new operating system? Something different, stable and reliable? Maybe the Linux OS Ubuntu 7.10 or OSX Leopard 10.5 ? I have both OS X 10.x and Ubuntu 7.x running on separate laptops, and have used them for over 2 years now. The similarities are outstanding in more than a few ways. Below is PART 2 of my reviews and summary of main features of the latest Ubuntu 7.10 (codename Gutsy Gibbon) which have made it so appealing over Apple’s OS X. First and foremost, lets not forget that you get what you pay for, and since Ubuntu is free compared to the OS X Leopard , there are going to be some obvious added applications and tools in OS X which Ubuntu does not have (similar applications can be added in Ubuntu in most cases, again at no cost since there are no license fees and its open source). My intent here is to educate the average user on their options. For the average user, installing a new operating system may seem challenging, not to mention learning its new interface and features. This is the main reason why Apple’s OS X is so popular, its simplicity and features are key strengths. A PC running Ubuntu can be as easy as a Mac to use , the key is configuring it properly, there is no need to be intimidated with Ubuntu. Let me show you. Getting Ubuntu is easy, installing it was also a breeze ever since version 7.04. As outlined in my PART 1 review of the process briefly here in my video tutorial. I recommend you download the CD Installer and create a bootable installation CD. The minimum memory requirement for Ubuntu 7.10 is 384MB of memory and 4Gigs of space (for OS X Leopard its 512MB of memory and 9 gigs of space). What I was initially surprised of is the built in support for dual boot (OS X Leopard has Boot Camp) I had Windows XP already installed and Ubuntu allowed me during installation to setup partions and allocate space for the new OS to be installed keeping my Windows (XP or Vista) installation intact, and at the same time created the boot manager (aka Grub Boot Manager) which allows you to select the operating system on bootup. One thing to note here is that you should have a network connection for Ubuntu auto update to later get updates online. Detection of hardware was smooth on my Lenovo T60 laptop (Dual Core PC), I did not have to get any additional drivers for my ATI video card to get anything to work. The fact that Ubuntu can run on different processor platforms (x86 architecture, PentiumTM, CeleronTM, AthlonTM, SempronTM and 64bit AMD and Intel chips) and is not setup to be proprietary to specific hardware making Ubuntu attractive to anyone with a basic Pentium chip to the most high end Quad Core PC. Once you finish installation you would have also created the primary account ID and password during the setup wizard. this user ID has the permissions of a super user (Administrator access) for further configuring Ubuntu later. 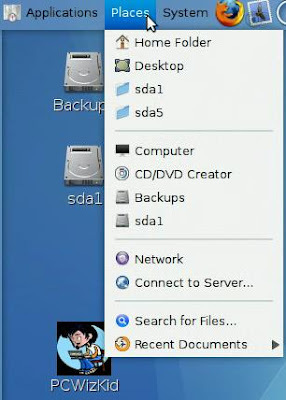 The default desktop is not blue and does not look like OS X Leopard . However it is clean, intuitive and easy to navigate. The screen shot I have here is after I configured the appearance and added a Dock to mimic Leopard [Click to enlarge] which shows you how flexible this operating system can be. Details on installing the AWN Manager and the Dock will be described in detail in PART 3 of my review summary. Your first instinct may be to check out the menus and programs that come by default. I found that there was a generous amount of standard applications and accessories. 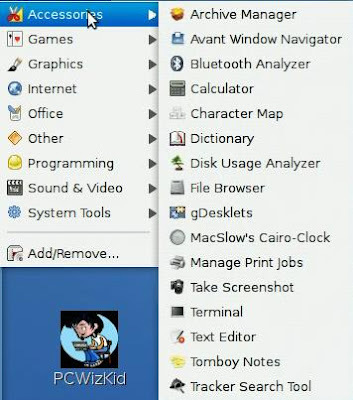 The main applications menu has the necessities such as the Open Office Suite (similar to Microsoft Office) , Evolution Mail (very similar to OS X Mail app) and Firefox (under the Internet menu option) and a generous set of multimedia utilities to play video, audio and manage your photos. The menus are well organized and as you would expect shortcuts to be bundled under specific groups. Intuitive and straight to the point. These menus can be further configured to display more or less items as desired under the system preferences option for the main menu. Details of configuring appearance are in my Part 3 review and desktop effects will be in PART 4 of my review. The “Places” menu option allows you to browse your PC and / or network drives , just as the “Finder” option in OS X does. In my case I have this PC Dual Boot with a NTFS file system for Windows and have mounted my windows drives (using the NTFS Configuration Tool) so I can access them normally (I will post a how to video on this later). The System Preferences gives you all the access you need to tweak and configure your computer, set your preferences for not just appearance but also screen resolution, power management , get hardware information and much more. [Click the image to enlarge] This is where most customization can be done regarding the theme and desktop effects. Ubuntu can be more than just eyecandy, use it as a secure method to connect online, worry less about viruses that plague the Windows OS, it has support for wireless and bluetooth connectivity and is not a resource hog. I find Ubuntu smooth with all the Desktop Effects I have enabled. 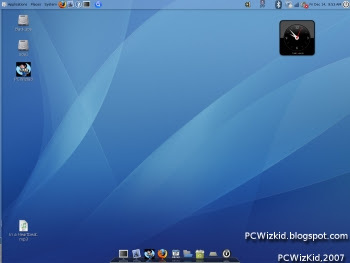 In my PART 3 review summary of Ubuntu 7.10 vs Leopard I will show how to configure various areas of the Ubuntu OS and where to get additional addons to spice up your experience similar to Leopard . If your interested in learning about a few pros and cons on Ubuntu 7.10 read my previous article. ~ by PCWizKid on December 15, 2007. It works thanks i liked it a lot pluse it is very easy to use and it also looks great on Xps. ✅Web Browser of 2017 Browser Wars is back!